(NaturalNews) In what has to be the most accurate currency crash prediction ever made, bitcoin crashed today from $266 to a low of $105 in a rapid "free fall" market crash pattern, erasing $1 billion in currency valuation in a matter of hours. I openly and publicly predicted all this would occur yesterday, in both a Natural News article as well as national radio via the Alex Jones Show broadcast aired on over 120 am stations. Earlier this morning, Mike Adams of Natural News penned a warning to investors and those seeking privacy and wealth protection by utilizing the digitally encrypted BitCoin currency unit... A few hours after Adams' dire warning was posted, the crash he warned about has become a reality. This morning, without warning, and moments after Bitcoin achieved its all time highs, the currency collapsed over 50%, essentially vaporizing upwards of one billion dollars in value. Bitcoins have been surging beyond $200 amid mass speculation and bandwagon investment, but as of this writing bitcoin value has dropped from $266 to a low of $105 -- a crash that was predicted verbatim just several hours before by Mike Adams of NaturalNews. "Eventually it's going to crash hard. I bet my reputation on that, Alex. 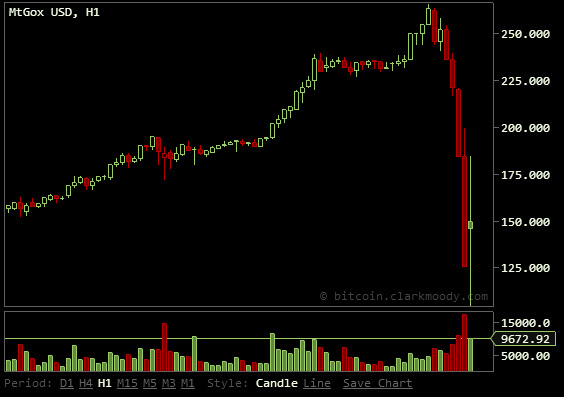 I am 100% sure we are going to see a massive bitcoin crash at some point with an ultra-accelerated velocity. It will be the fastest crash of any currency in the history of human civilization. It will be a high-velocity crash. People are buying bitcoins who don't know what bitcoins are and who have no use for them. These are speculators." What's especially freaky about this bitcoin crash is that it followed almost word-for-word from my predicted "recipe" of how the central banks could destroy bitcoin. Wednesday's wild ride came as someone gave away thousands of dollars worth of Bitcoins on Reddit, the social news site. News blog Business Insider calculated a Reddit user under the name "Bitcoinbillionaire" had given away $13,627.69896 worth of Bitcoins to Reddit users over the day. This giveaway is what apparently caused the bitcoin crash. But I have news for everyone. Having now made, on the record, the single most accurate crash prediction ever publicly announced on bitcoin, I think I've earned the credibility to tell you more: Bitcoinbillionaire is almost certainly not a friend of bitcoin. He is likely working for the central banks. How do I know that? Because the "bitcoin giveaway" that crashed the market today was a calculated stress test to determine the "buoyancy" of the bitcoin market. By injecting a predetermined amount of supply into the market and watching the price reaction, it can easily be calculated how many bitcoins will be required to crash the entire market down to a desired price level, causing a runaway panic. This engineered crash was, in effect, a currency war probe attack designed specifically to calculate what is needed for a much larger attack planned for the future -- an attack that will decimate bitcoin and cause long-lasting distrust in non-centralized currencies. Step 1) Central banks buy up massive quantities of bitcoin currency, driving the prices into the stratosphere and encouraging millions of people around the world to jump on board the "get rich" bandwagon. Step 2) Once bitcoin valuations reach a sufficient level of insanity, start a massive selloff by dumping the bitcoins you already bought onto the market, offering them for sale at any price (i.e. sell into falling prices, accelerating the loss in valuations). Step 3) Watch panic take hold as the bitcoin crash accelerates, ending in a catastrophic wipeout of "valuation" of all bitcoins. Step 4) Find "victims" of the bitcoin crash who can tell a good sob story for the mainstream media about how they invested little Johnny's college money in bitcoin and lost it all. Roll them out on CNN and MSNBC where they cry on camera and talk about how they were ripped off by bitcoin and now they only trust the government from now on. Step 5) Demonize bitcoin by characterizing it as a "libertarian pyramid scheme." Lash out against both decentralized currencies and libertarians. Step 6) Once the demonization gains traction, have traitors in the U.S. Congress announce a "Consumer Currency Protection Act" that outlaws non-central bank currencies such as bitcoin. It's all "for your safety," of course. Shut down all online bitcoin wallets and exchanges, calling them "criminal pyramid schemes" and arrest a few people using bitcoin to send a warning message to the rest. Although bitcoin quickly recovered some of its losses today, the extreme volatility is a huge red flag for this currency. Why? Because it means merchants won't want to accept payments in bitcoins because they could lose half their pay values in mere hours. This damage is already done. In the minds of merchants who were considering accepting bitcoin, bitcoin's reputation has been destroyed as of today. 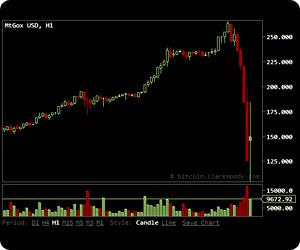 So this crash event is terrible news for bitcoin's wider acceptance as an everyday currency. I'm even thinking of pulling it from the Natural News Store, since we can't rely on bitcoin payments to have any real value by the time we get paid. On the speculation side, bitcoin volatility is also a red flag warning sign: Volatility equals RISK, and risk is something that a lot of people don't have an appetite for. Once people full realize that bitcoin won't keep going up "forever and ever" as they had foolishly dreamed, most of them will exit the market by selling bitcoins. After all, most of the buyers had no idea what bitcoins were in the first place, so there's really nothing stopping them from ending their little investment experiment. Finally, I want to dispel any rumors that I personally caused the bitcoin crash. People claiming this are using the same lame excuse the central banks use when they want to blame patriots for bank runs. "It's their fault for telling people to take their money out of the banks!" I didn't crash bitcoin and I have no insider information on bitcoin other than the same public information we all have access to (bitcoincharts.com, Coinbase, etc.). Anyone blaming me for crashing bitcoin is just flat-out stupid and delusional, and they're probably angry at me because they lost money in the bitcoin crash (which I warned them would take place). I love how insane our world has become where a guy who can do math (me) is considered an "conspiracy insider" because he can calculate mathematical projections. The mere act of saying 2 + 2 = 4 makes you a conspiracy theorist these days, it seems. And don't even get me started on the U.S. national debt or the global derivatives pyramid scheme (which will also collapse in time, by the way). Honestly, the bitcoin bubble was not that difficult to predict. It was obvious. Only a fool could have failed to see the signs. But the world is full of fools, I've learned. And when they are blinded by greed, no amount of good sense can penetrate their skulls. So I'm just the guy blowing the whistle and warning people about mathematical reality. I have no horse in this race when it comes to bitcoin, unlike other large-scale bitcoin holders who stand to lose millions of dollars if valuations tumble. If I were an evil sonofabitch who only cared about money, I could have long since fleeced millions of dollars from gullible bitcoin buyers through the use of some relatively simple automated algorithms that I already described on the Alex Jones Show. But that's not what I'm into. I don't feel like I'm "winning" by taking money from other people who are losing it. That's not what I'm about. So instead of bilking the bitcoin market, I'm warning people about it instead. If I'm going to take money from someone, I want it to be a voluntary transaction where they gain something of value in return (such as buying superfoods from the Natural News Store). I have no interest whatsoever in zero-sum-game transactions where my "win" requires someone else to "lose." I despise Wall Street, in other words. And central banks. I don't hate bitcoin, for the record, but I do know when something looks like a bubble and people need to be warned. My hope is that the hype mania of bitcoin can burn out and we can get back to the old bitcoin that was less volatile and far more affordable. I would like bitcoin to succeed, but now it is obvious that its reputation can be decimated at the merest flinching of the central banks. To think: this crash was caused by nothing more than $13,000 or so worth of bitcoins flooding the market all of a sudden, causing the loss of $1 billion in market valuation. How's that for outrageous volatility?